If you haven’t gotten on the organic band wagon, I’ve got some more convincing to do. The following is largely from an article in Organic Gardening Mag. You should be eating a heavily weighted diet of plants and raw foods. I don’t want to hear the same old BS that we are meat eaters and should be eating red meat. That may have been true 100 years ago, but not know. Chemistry has gotten into our diet. Chemists have found ways to increase the yield of everything and haven’t thought about the long term costs until recently. If you don’t eat organically grown food you are ingesting 12 or more chemicals and pesticides that can HARM you, your family and your future family. The hormones in the dairy and meat we eat are changing the size of the human race. Maybe you’ve heard of the chemical “Roundup”? Supposed to be one of the safest weedkillers around. So safe that chemists have genetically engineered crops like corn to be “Roundup ready”, meaning that a corn crop can be planted then when the weeds start to grow and compete with the corn, Boom, just fly by with a crop duster and spray Roundup on everything and the genetically engineered corn being resistant to the Roundup lives on while the weeds die. Sounds great, doesn’t it. Not so much. Roundup is not just salt as we might have heard. The main component of Roundup is GLYPHOSATE. Glyphosate is a systemic chemical, which means it is absorbed into the root system of the plant. People being lazy, greedy, bastards, farmers are no exception. They found that using Roundup increased the yield of their crops and was a whole lot easier and cheaper to use. So much so that researchers can find glyphosate in RAIN and in the air and of course our ground water and streams. In 2009 the USDA says that farmers sprayed 57 million pounds of glyphosate on food crops. That alone is reason to buy and eat organic. Not convinced? I’ll proceed. To be brief – glyphosate is a hormone-disrupting chemical. It is linked to metabolic damage, infertility, obesity, learning disabilities and birth defects. Need More? Really? If you are smugly thinking that you are a meat eater and don’t eat much corn, think again. Most cattle are raised on CORN and that corn is Roundup ready. Don’t believe me – take a trip to Nebraska. In fact if you live in a corn growing state like Nebraska, you are drinking glyphosate in your household water unless you have a granular activated carbon filter to remove it. I’m not just being crude. Human sewage sludge is used as fertilizer in farm fields. Yes, that is a potential source of salmonella out breaks or worse. I make this point because another huge problem is hormone-disrupting phthalates which are very common fragrance chemicals used in soaps and shampoos. Phthalates are being found inside our produce and the only reasonable source is the sewage sludge. EAT ORGANIC- the use of human sewage is banned in organic farming. Fat and don’t know why? May be you eat too much. But maybe it is the pesticides that are making us fat. Even in very low doses, pesticides tamper with our body’s natural weight loss chemistry. These are also linked to cancer and type 2 diabetes, go figure. The nice thing is that eating organic for just five days can rid the body of virtually all pesticide residues. Avoid synthetic fragrances, soft vinyl products and “slow release” or gel-coated medications to eliminate phthalates. And of course eat organic. Pesticides can interfere with your vitamin D levels. Organophosphates are a class of pesticides that include 20 or more different pesticides and account for more than 70 percent of the pesticides used in the US. It is known that these pesticides interfere with the body’s ability to metabolize vitamin D. D, known as the sunshine vitamin protects us from cancer, diabetes, infections, heart desease, broken bones and boosts our immune system. Feed Lot Farming – now this is a story in its own right, but hopefully you’ll read it anyhow. 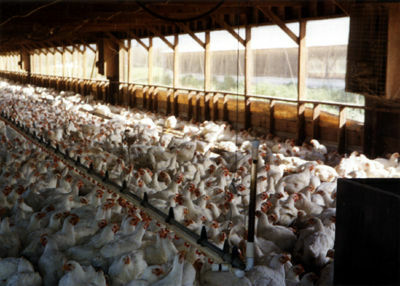 Feed lots are a farming method to raise a large number of cattle or fowl in a small space. The animals are herded into tightly packed pens or corals. They are fed in situations that force the animals to eat their own feces. These “Lots” are so filthy the farmers inject low levels of antibiotics into the animals to keep them health, which in turn end up in the meat we eat and cause antibiotic resistance in humans. All mass produced animals including cows, chickens, turkeys, pigs, dairy cattle and sheep are raised this way. In such conditions pests can also be a problem, so farmers spray the herd or flock with pesticides which also get into their food. Conditions are so bad that e.coil bacteria is a problem, so to prevent it from getting into the food supply, after slaughter, one method is to wash chickens in a chlorine bath that contains 30 times more chlorine than a swimming pool. To mask the chlorine odor and supposedly to keep the bird moist while cooking, the chickens are then injected with a solution of water and phosphate. Phosphate can increase our risk of kidney disease, weak bones and even cause premature aging.